The soul of Sanatana Dharma lies in the immortal Upanishad words ‘tattvamasi’ – Thou Art That. This great uttering becomes a reality at the abode of Lord Ayyappa. When standing before Ayyappa with tear drenched eyes, realization dawns on each devotee that Supreme Soul and I are one. Caste, creed, color, religion, and social status melt away before Ayyappa, who is aptly referred as Dharma Shasta – one who teaches and upholds Dharma. 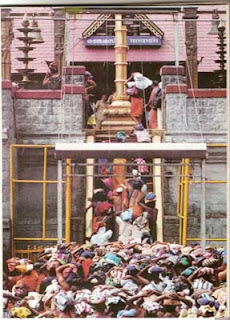 Social equality, which often remains in paper and speeches, becomes a reality during the Sabarimala pilgrimage. Philosopher and ordinary mortal becomes numb before Lord Ayyappa and enters into a frozen state for a split second before giving way to the following devotee. Amidst the full throated chanting of Swamiye Saranam Ayyappa, devotees forget to open the long list of materialistic needs. Many devotees re-enter the long queue with a determined mind to open the long list of materialistic needs but believe it or not each time the devotee forgets himself and he is lifted to a different plain of realization, a realization which words fail to explain.